Family Friendly Apartment with full kitchen-dishes, pots, pans, coffee/tea-even a popcorn maker!, Full bathroom with washer/dryer, pool table, sauna, cozy gas fireplace, large t.v. with comfy couch. High Quality Queen mattress bedroom space privately screened with curtains ( NOT a separate bedroom ) Trundle bed with two high quality twin mattress, provide sleeping for 4. Owners live in main house. From the on-site parking area there is a path to the private entrance to the basement suite with views looking out to the backyard gardens and pond area. Private woodland setting, yet very close to town. Mark and Laurie LOVE the outdoors! We also love to travel, but can't think of a better place to LIVE. We live in the main house with private, attached, apartments. Mark and Laurie have a home based contracting business, but are often on the road working on local projects. Laurie also teaches Pilates with an small on-site studio for those who might want to have some lessons-beginner and advanced options. Mark golfs, while Laurie practices Pilates, runs, bikes and gardens. We also have an active Volunteer work-life. We both grew up in the Champlain Valley-and love to share all we know about this Paradise like place we call home. Laurie grew up in Burlington, Mark in Colchester. We thoroughly enjoy meeting people who become our guests, and often our friends, from all over the WORLD! We hope you choose to stay at our "Home Away From Home" in Shelburne and we will do our best to make your stay SPECTACULAR! We feel this area has some of the most beautiful scenery in the world. We love the country, but also love being close to everything. The piece of land we built are home on offered both-Peaceful, country like setting but minutes to every convenience. In the Warmer months, we LIVE on the screen porch that looks out onto the ponds and gardens. While the screen porch is part of our home, we happily share the space for all our guests to enjoy. There are plenty of opportunities to enjoy this area privately, we are often away. The Hot tub in the cooler months is located here and available for all our guests. It is meticulously maintained. In the Summer, the outdoor pool and garden areas are a pleasure for all to enjoy. One full bathroom with a full tub/shower, stacked washer/dryer, blow dryer, towels, etc. We are in a rural setting, with hiking trails right outside the door. Yet, we are very close to beaches,restaurants, shopping, coffee/wine shops, grocery store, pharmacy, recreation &entertainment. There is spotty cell service, depending on your carrier. The wifi works well. If you need to use our land line, let us know and we will happily loan you our line. There is a separate Pilates studio on site for an extra fee. There are running, hiking paths, health clubs and yoga studios very close by. Full Kitchen with all pots, pans, dishes, untensils, refrigerator, microwave, crock pot, even a popcorn machine! Guests are welcome to enjoy the pond and garden areas on our property, as well as the walking/hiking trails. The pool area has lounge chairs, a table with 4 chairs and a sun umbrella for all guests to enjoy. Kwiniaska Golf Course .07 miles from our home, many others close by. This is in the basement suite and is for the exclusive use of guests in this unit. This is a high quality hot tub that we maintain and request that showers be taken to remove any body lotions, etc..This helps us to keep the water in pristine condition for our guests. Please let us know if you have any questions at all. This area has so much to offer it is difficult to list it all. Please let us know what you are looking for and we will let you know if we think this is a good fit! SMOKING POLICY: There is absolutely NO SMOKING allowed on the property inside or outside. This is for the health, safety and comfort of all our guests and our personal preference since we also live at the property. We appreciate your cooperation in this matter. VISITORS: No parties are allowed on the property. The property and amenities are for the use of guests indicated when booking. Additional guests beyond the guests listed when booking will be subject to additional fees. ( We had one guest invite several friends resulting in 3 additional vehicles in our driveway so we felt the need to address this! ) We have guests that enjoy visiting, some even want to share a glass of wine and h'orderves. That said, we honor our guests with all the privacy they want/need. I rented this apartment for an extended stay while relocating to Burlington, VT. It truly did become like a second home and I very much enjoyed my stay. I had everything I needed and then some. The gas “wood” stove was especially nice since I was renting in December and January. The Kotorman’s were very welcoming hosts and gave great advice about the area. 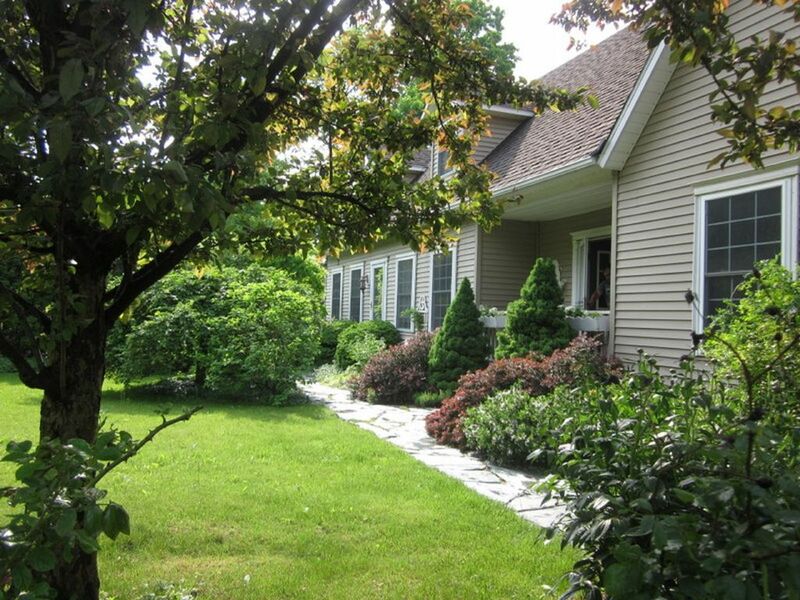 The property is very close to Shelburne and all it has to offer, which is quite a bit. The commute to Burlington is also very convenient. My only regret is that I didn’t bring my snowshoes so I could snowshoe the trails to Shelburne village after one of the snowstorms! Jeff was a fabulous guest! We highly recommend hosting this great guy-he left the apt in superior shape! We loved our stay. The apartment was beautiful and very clean. Very close to Shelburne’s quaint town and close enough to Burlington for the more urban experience. Lana thanks so much for your lovely review. You are a 5 star guest! Thanks for staying with us and we are so glad you enjoyed your stay. We had a wonderful time visiting VT in October. So many beautiful sights to see in the fall!! Our apartment in Shelburne at the home of Mark and Laurie Kotormann was lovely and very cozy for the 2 of us. Very clean, neat, well maintained and furnished! We loved it! Thanks for the excellent experience on our 1st (but not last) trip to Vermont! The visual here is a lovely open porch, however, there is no mention in the description that the apartment, while well-appointed is in the basement with almost no natural light. This should be mentioned in the description. As someone who doesn't enjoy any subterranean environment, I would have searched further. The apartment is clean, comfortable, all sorts of amenities (washer/dryer, great kitchen/bath, big screen tv and very clean..sauna for Winter, pool for Summer. If the darkness isn't an issue, Laurie is lovely and I would recommend. Wifi is a challenge because of the basement. Located just a mile or so off Hwy 7, the location of this property was perfect for our visit to NW Vermont. The grounds are stunningly gorgeous and the apartment itself was impeccably clean with beds more comfortable than mine at home! I would definitely stay here again, should I need to overnight in the area. We thoroughly enjoyed meeting you Shell, would love to have you stay with us again. Thanks for the glowing review! great landscaping. Laurie and Mark were great. Thanks so much for staying with us! We really enjoyed meeting you-hope you brought some great memories of VT home with you. This apartment is in a quiet country setting, yet very conveniently located in the heart of an abundance of great places to see and things to do. Shelburne is home to the World Famous Shelburne Museum, Shelburne Farms, Vermont Teddy Bear Factory, Beautiful Shelburne Bay on Lake Champlain and much more.. This is a IDEAL destination for families, couples or individuals looking for fresh, farm to table, local food options, beautiful scenery and plenty of outdoor recreational options for every season. Fiddlehead Brewery, Folino's Pizza and Shelburne Vineyard, are all highly recommended, and less than 3 miles away. In fact, there are so many great restaurants in Shelburne, things to do, you do not even need to leave town for an amazing vacation experience. Please refer to our on site "Guest Guide Book" that highlights all the best spots in town.places, and all the "inside scoop" only a "local" could provide. In Shelburne, Burlington ( 7.4 miles North ) and the surrounding Lake Champlain Valley, there are no shortage of activities and festivals each weekend to choose from. Or if quiet and downtime is what you yearn for we are happy to direct you to tranquil places to sooth your soul. You choose: quiet reflection, meditation, reading, or even a nap- on site or close by. We live on site, in a separate Main house which the apartments are attached to. You have your own private entrance , so there is a good chance you might not see us. We offer as much privacy as you need, however we are absolutely available for questions, and/or providing you with anything you need to make your stay more comfortable and pleasurable. We hope you stay with us! We feel privileged to host guests from all over the World-We can not think of a better way of life! SMOKING POLICY: There is absolutely NO SMOKING allowed on the property inside or outside. This is for the health, safety and comfort of all our guests and our personal preference since we also live at the property. We appreciate your cooperation in this matter. VISITORS: No parties are allowed on the property. The property and amenities are for the use of guests indicated when booking. Additional guests beyond the guests listed when booking will be subject to additional fees. ( We had one guest invite several friends resulting in 3 additional vehicles in our driveway so we felt the need to address this! ) We have guests that enjoy visiting, some even want to share a glass of wine and h'orderves, and we are happy to oblige. However, if you want a more private experience, we are happy to give you all the privacy you need. We both work, our business is home based. We are on the road, in and out often, some days gone the entire day. Mark and Laurie are available always by cell at 802-318-8389 Mark 8388 Laurie.